1. Boil water in kadai and place a glass bowl in the center. Melt butter in bowl and switch off the flame. Keep the bowl in the hot water throughout the process. 2. Add powdered sugar in melted butter and mix well. 3. Mix cocoa and milk powder together and add in sugar butter mixture. Mix well all the ingredients till the cocoa absorbs butter and becomes a thick mass. 4. Add vanilla essence and mix well. Chocolate mixture is ready. Remove the bowl from the kadai. 5. Immediately add the chocolate mixture in plastic/silicon molds. Press it gently in each mould. for setting, place the filled molds a refrigerator for 1 hour or in fridge for 1/2 hour. 6. 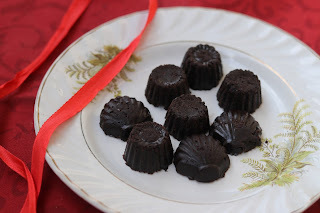 Un-mold the chocolates and enjoy these cocoa powder chocolates. These chocolates are quite fuggy. Note - to prepare smooth silky chocolate, mix 3 tbsps milk powder with 1 tbsp cocoa powder. Also use cocoa butter rather than plain butter.